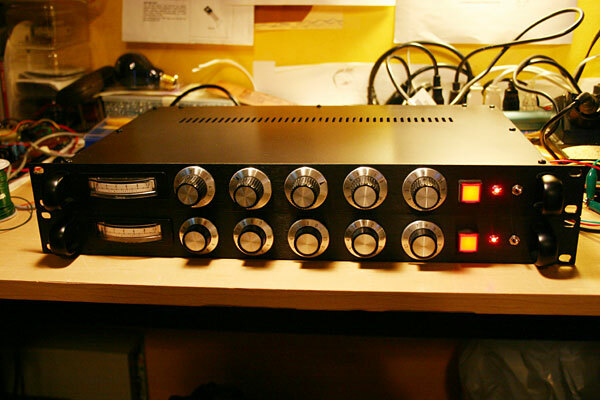 The GSSL is a clone of the stereo buss compressor found in SSL4000-series desks. Because of it’s affordability and relatively low difficulty, the GSSL has become a very popular project with many PCBs and mods available. Changes the sidechain from summed (mono) to stereo. This makes the GSSL behave more like the original SSL. Fixes power hum problems inherent in the original GSSL design. Usually GSSL builders use a peak meter. The VU meter makes the “feel” of the compressor closer to, say, the 1176. Adds adjustable 60, 90, 130 & 200hz high-pass filters, Tilt-Medium and Tilt-Loud sidechain eq curves, and the option for an external sidechain input. A blog about building a GSSL. Five Fish’s GSSL build blog with sound clips. Added by Peterson Goodwyn on September 7, 2010 and last modified by Peterson Goodwyn on February 22, 2016.